, an eminent English civilian and antiquary, was born in 1713 in Normandy; whence his father, who was descended from an ancient family at Caen in that province, came to England, soon after the birth of his second son James, and resided at Greenwich. The early rudiments of instruction he probably received in his own country. In 1729, being at that time a scholar at Eton, he was three months under the care of sir Hans Sloane, on account of an accident which deprived him of the sight of one eye. In 1731, he was admitted a gentleman-commoner of St. John’s college, Oxford; proceeded LL. B. June 1, 1738, and LL. D. Oct. 21, 1742; became a member of the college of Doctors Commons in November, 1743; and married, in 1749, Susanna a worthy woman, who had been his servant; and who survived him till Oct. 6, 1791, when she died in an advanced age. Though disappointed in his wishes of entering into holy | orders, he became intimately connected with the church He was elected commissary or official of the peculiar and exempt jurisdiction of the collegiate church or free chapel of St. Katharine, near the Tower of London, 1753; was appointed commissary and official of the city and diocese of Canterbury, by archbishop Herring, in December, 1758; and of the subdeanries of South Mailing, Pagham, and Terring, in Sussex, by archbishop Seeker, on the death of Dr. Dennis Clarke, in 1776. He was elected F. A. S. Sept. 22, 1737, and was one of the first fellows of the society nominated by the president and council on its incorporation 1755. 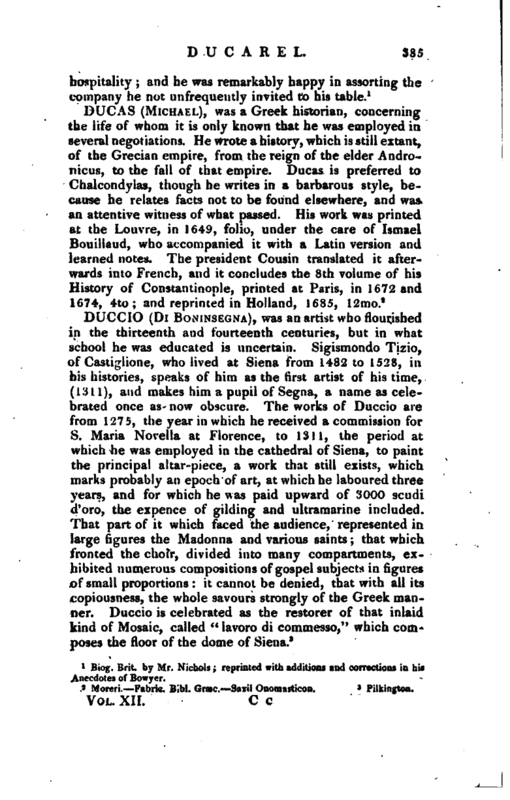 He was also elected Aug. 29, 1760, member of the Society of Antiquaries at Cortona; on which occasion he sent them a Latin letter drawn up by his friend the late rev. Philip Morant. He was admitted F. R. S. Feb. 18, 1762; became an honorary fellow of the Society of Antiquaries of Cassel, by diploma, dated in November, 1778; and of that of Edinburgh in 1781. In 1755, he solicited the place of sub-librarian at the Museum, in the room of Mr. Empsom; but it was pre-engaged. 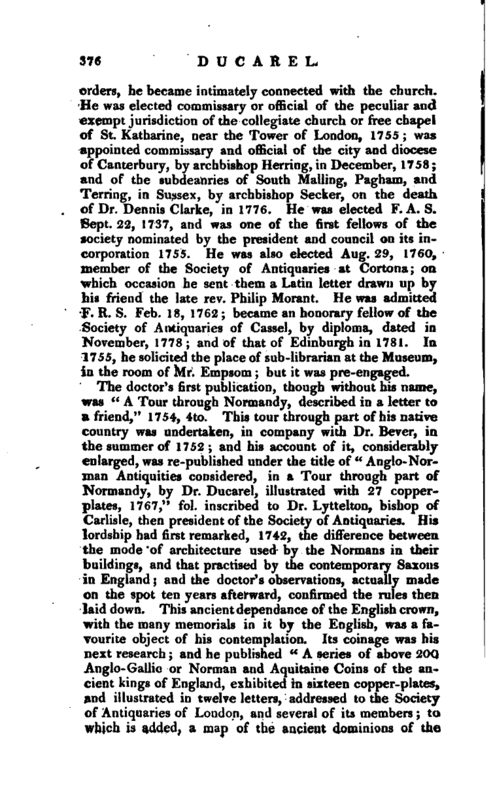 The doctor’s first publication, though without his name, was “A Tour through Normandy, described in a letter to a friend,” 1754, 4to. This tour through part of his native country was undertaken, in company with Dr. Bever, in the summer of 1752; and his account of it, considerably enlarged, was re-published under the title of “Anglo-Norman Antiquities considered, in a Tour through part of Normandy, by Dr. Ducarel, illustrated with 27 copperplates, 1767,” fol. inscribed to Dr. Lyttelton, bishop of Carlisle, then president of the Society of Antiquaries. His lordship had first remarked, 1742, the difference between the mode of architecture used by the Normans in their buildings, and that practised by the contemporary Saxons in England; and the doctor’s observations, actually made on the spot ten years afterward, confirmed the rules then laid down. This ancient dependance of the English crown, with the many memorials in it by the English, was a favourite object of his contemplation. 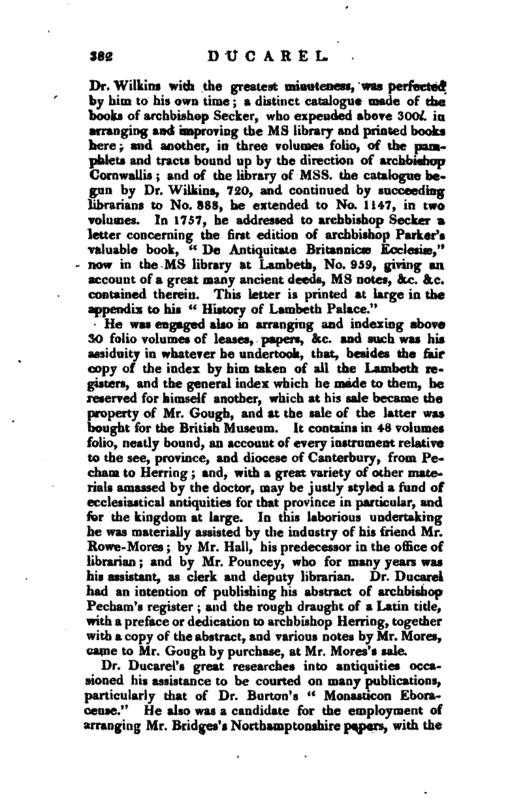 Its coinage was his next research; and he published “A series of above 200 Anglo-Gallic or Norman and Aquitaine Coins of the ancient kings of England, exhibited in sixteen copper-plates, and illustrated in twelve letters, addressed to the Society of Antiquaries of London, and several of its members; to which is added, a map of the ancient dominions of the | Icings of England and France, with some adjacent countries, 1757,” 4to. His portrait, engraved by Perry, from a painting by A. Soldi, 1746, was first prefixed to this work, which was the result of his acquaintance with i\l. de Boze, keeper of the French king’s medals, and secretary of the academy of inscriptions and belles lettres. (See Boze). In this undertaking- the doctor found himself seconded by sir Charles Frederick, who engraved all the Aquitaine coins in his possession, in 36 quarto plates, but without any description or letter-press, and intended only for private use, being little known before their circulation on his decease. Dr. Ducarel had some view to forming a series of English medals, which, by admitting such as have been struck abroad relative to the history of this kingdom, he thought could be carried beyond the conquest, provided the medals proved genuine. But when he engaged Francis Perry to engrave a series, of which the late Mr. Hollis gave the outline, he began no earlier than Henry VIII. and closed it with James I. in ten plates. Three supplemental ones were afterwards published of the same period. 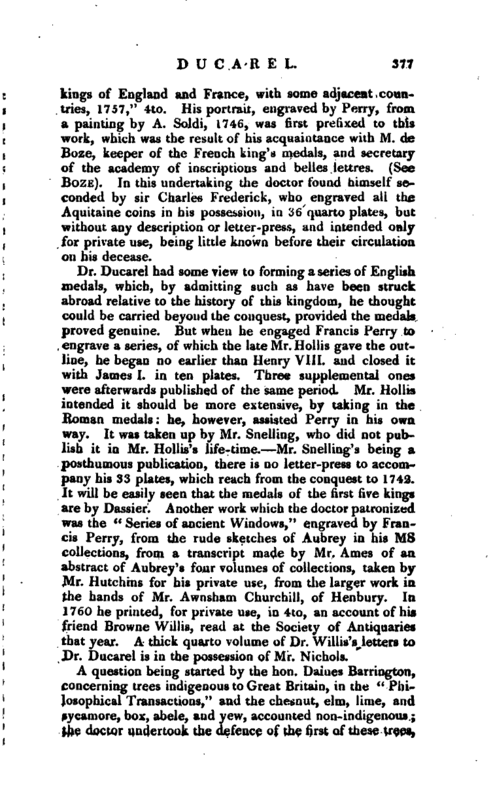 Mr. Hollis intended it should be more extensive, by taking in the Roman medals: he, however, assisted Perry in his own. way. It was taken up by Mr. Snelling, who did not publish it in Mr. Hollis’s life-time. Mr. Snelling’s being a posthumous publication, there is no letter-press to accompany his 33 plates, which reach from the conquest to 1742. It will be easily seen that the medals of the first five kings are by Dassier. Another work which the doctor patronized was the “Series of ancient Windows,” engraved by Francis Perry, from the rude sketches of Aubrey in his ms collections, from a transcript made by Mr. Ames of an abstract of Aubrey’s four volumes of collections, taken by Mr. Hutchins for his private use, from the larger work in, the hands of Mr. Awnsham Churchill, of Henbury. In 1760 he printed, for private use, in 4to, an account of his friend Browne Willis, read at the Society of Antiquaries that year. A thick quarto volume of Dr. Willis’s letters to Dr. Ducarel is in the possession of Mr. Nichols. 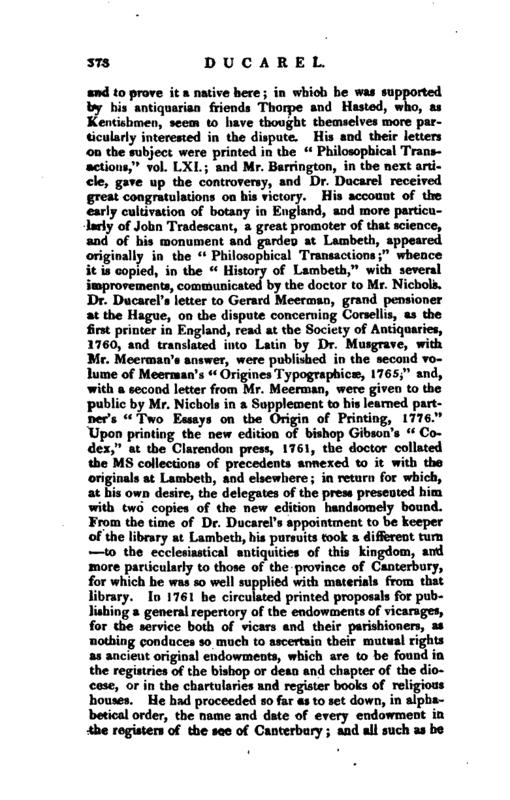 The share he took in the Rowleian discovery and controversy, of which he entertained what is now the general opinion, may be seen in the Gentleman’s Magazine, vol. | LVI. pp. 361, 362, 461 464, 544—547, 530, 859 where is printed, his correspondence with Mr. Chapman, rector of Weston near Bath, bishop Percy, Mr. Barrett, the historian of Bristol, whose credulity in these matters was notorious, and Mr. Whitaker. In 1776 was printed, for private use, “A list of various editions of the Bible and parts thereof, in English, from 1526 to 1776,” in a single sheet, 8vo; and an improved edition, 1778, at the expence of archbishop Cornwallis. This little tract owed its rise to a list of English Bibles copied from one compiled Ly Mr. Ames, from 1526 to 1757, presented by Dr. Gifford to the Lambeth library. It was completed by Dr. Ducarel from his own observations, and the later discoveries of his learned friends, Dr. Percy, bishop of Droniore, and Mr. Tutet. 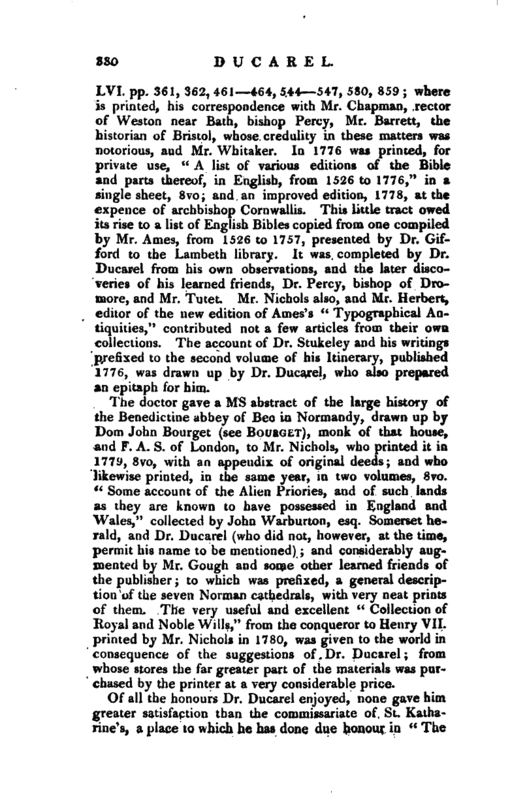 Mr. Nichols also, and Mr. Herbert, editor of the new edition of Ames’s “Typographical Antiquities,” contributed not a few articles from their own collections. 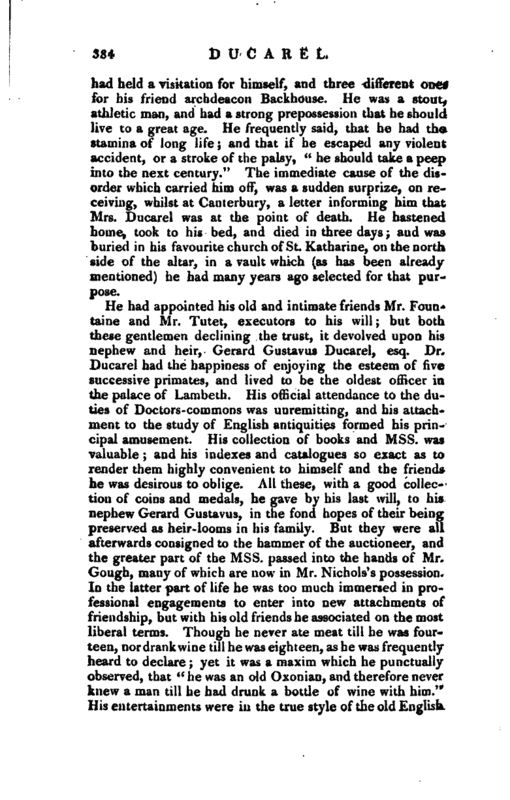 The account of Dr. Stukeley and his writings prefixed to the second volume of his Itinerary, published 1776, was drawn up by Dr. Ducarel, who also prepared an epitaph for him. The doctor gave a ms abstract of the large history of the Benedictine abbey of Bee in Normandy, drawn up by Dom John Bourget (see Bourget), monk of that house, and F. A. S. of London, to Mr. Nichols, who printed it in 1771’, 8vo, with an appendix of original deeds; and who likewise printed, in the same year, in two volumes, 8vo. “Some account of the Alien Priories, and of such lands as they are known to have possessed in England and Wales,” collected by John Warburton, esq. Somerset herald, and Dr. Ducarel (who did not, however, at the time, permit his name to be mentioned); and considerably augmented by Mr. Gough and some other learned friends of the publisher; to which was prefixed, a general description of the seven Norman cathedrals, with very neat prints of them, The very useful and excellent “Collection of Royal and Noble Wills,” from the conqueror to Henry VII. printed by Mr. Nichols in 1780, was given to the world in consequence of the suggestions of Dr. Ducarel; from whose stores the far greater part of the materials was purchased by the printer at a very considerable price. Of all the honours Dr. Ducarel enjoyed, none gave him greater satisfaction than the commissariate of St. Katharine’s, a place to which he has done due honour in “The | History of the Koyal Hospital and Collegiate church of St. Katharine, near the Tower of London, from its foundation, in 1273, to the present time, 1782,” 4to, with seventeen plates. This history was originally compiled by the doctor for the use of her present majesty, to whom a copy of it was presented in ms. a short time after her accession to the patronage of this collegiate church, the only ecclesiastical preferment in the gift of the queen consort of England. On a thorough repair of this curious old church in 1778, an empty vault was discovered in the chance.1, of a size that would hold two coffins, and no more. This spot the doctor claimed in virtue of his office; and has often pointed out to his friends, as a resting-place for his ashes and those of his lady; and the remains of both have been actually there deposited. 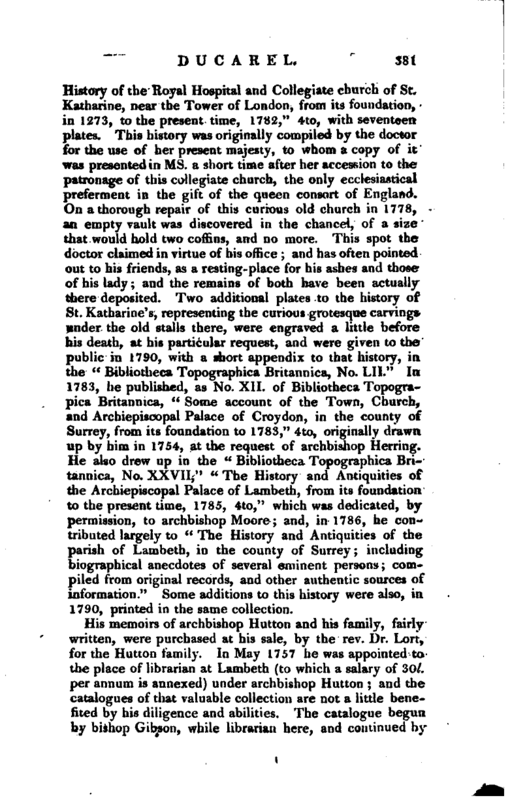 Two additional plates to the history of St. Katharine’s, representing the curious grotesque carvings under the old stalls there, were engraved a little before his death, at his particular request, and were given to the public in 1790, with a short appendix to that history, in, the “Bibliotheca Topographica Britannica, No. LII.” In 1783, he published, as No. XII. of Bibliotheca Topograpica Britannica, “Some account of the Town, Church, and Archiepiscopal Palace of Croydon, in the county of Surrey, from its foundation to 1783,” 4to r originally drawn up by him in 1754, at the request of archbishop Herring. He also drew up in the “Bibliotheca Topographica Britannica, No. XXVII,” “The History and Antiquities of the Archiepiscopal Palace of Lambeth, from its foundation to the present time, 1785, 4to,” which was dedicated, by permission, to archbishop Moore; and, in 1786, he contributed largely to “The History and Antiquities of the parish of Lambeth, in the county of Surrey; including biographical anecdotes of several eminent persons; compiled from original records, and other authentic sources of information.” Some additions to this history were also, in 1790, printed in the same collection. 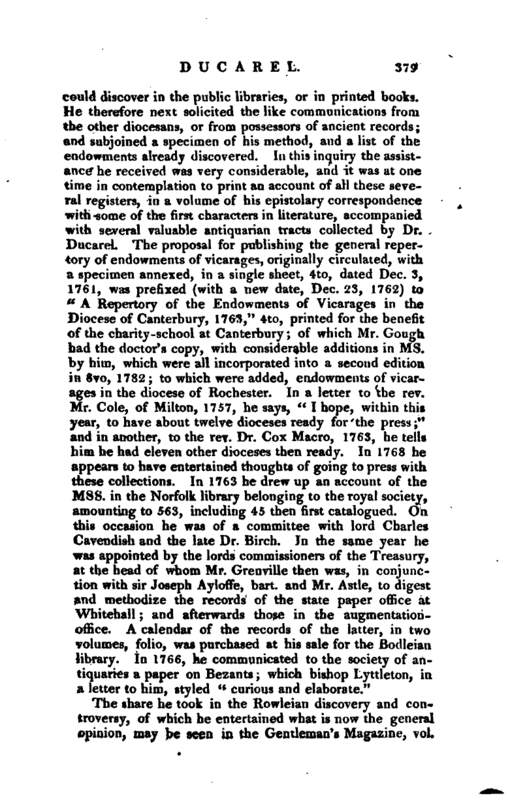 He was engaged also in arranging and indexing above 30 folio volumes of leases, papers, &c. and such was his assiduity in whatever he undertook, that, besides the fair copy of the index by him taken of all the Lambeth registers, and the general index which he made to them, he reserved for himself another, which at his sale became the property of Mr. Gough, and at the sale of the latter was bought for the British Museum. It contains in 48 volumes folio, neatly bound, an account of every instrument relative to the see, province, and diocese of Canterbury, from Pecham to Herring; and, with a great variety of other materials amassed by the doctor, may be justly styled a fund of ecclesiastical antiquities for that province in particular, and for the kingdom at large. In this laborious undertaking he was materially assisted by the industry of his friend Mr. Howe-Mores; by Mr. Hall, his predecessor in the office of librarian; and by Mr. Pouncey, who for many years was his assistant, as clerk and deputy librarian. Dr. Ducarel had an intention of publishing his abstract of archbishop Pecham’s register; and the rough draught of a Latin title, with a preface or dedication to archbishop Herring, together with a copy of the abstract, and various notes by Mr. Mores, came to Mr. Gough by purchase, at Mr. Mores’ s sale. For many years it was his custom to travel incognito in August, with his friend Samuel Gale, esq. attended only by his own coachman and Mr. Gale’s footman, George Monk. Twenty miles was their usual stage on the first day, and every other day about fifteen. It was a rule not to go out of their road to see any of their acquaintance. The coachman was directed to say, “it was a job; and that he did not know their names, but that they were civil gentlemen;” and the footman, “that he was a friend of the coachman’s, who gave him a cast.” They usually took up their quarters at an inn, and penetrated into the country for three or four miles round. After dinner, Mr. Gale smoked his pipe, whilst Dr. Ducarel took notes, which he regularly transcribed, and which after his death were purchased by Mr. Gough. They constantly took with them Camden’s Britannia, and a set of maps. 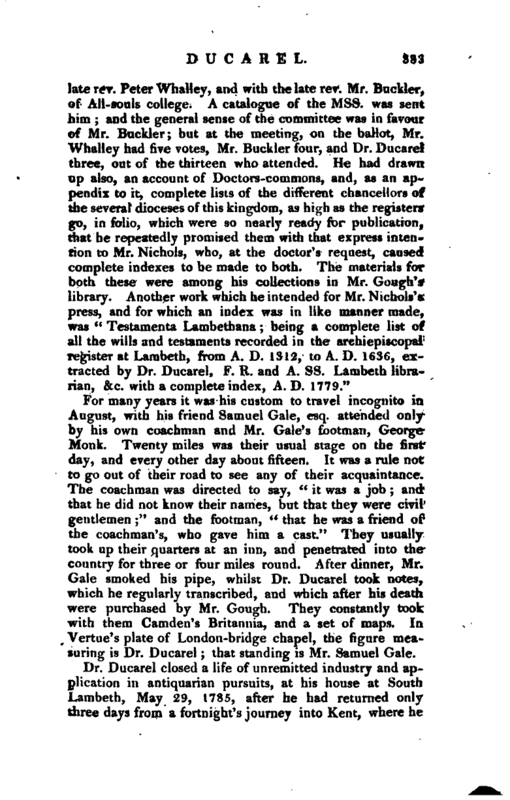 In Vertue’s plate of London-bridge chapel, the figure measuring is Dr. Ducarel; that standing is Mr. Samuel Gale. 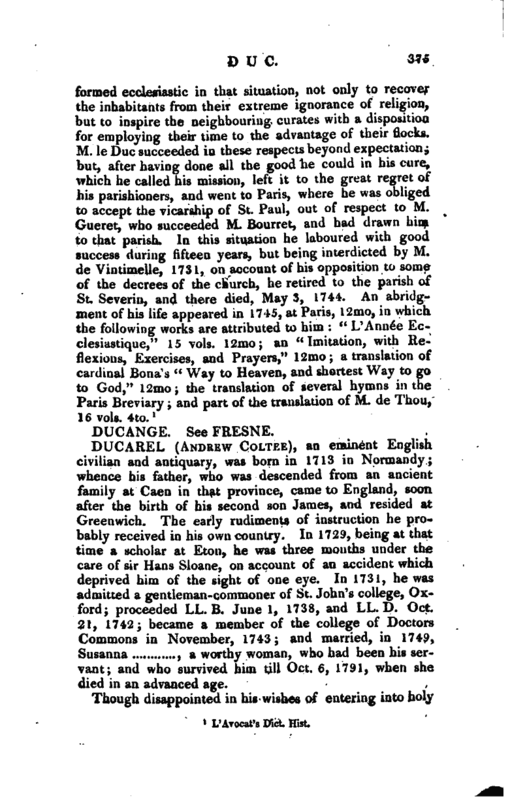 Dr. Ducarel closed a life of unremitted industry and application in antiquarian pursuits, at his house at South Lambeth, May 29, 1785, after he had returned only three days from a fortnight’s journey into Kent, where he | had held a visitation for himself, and three different ones for his friend archdeacon Backhouse. He was a stout., athletic man, and had a strong prepossession that he should live to a great age. He frequently said, that he had the stamina of long life; and that if he escaped any violent accident, or a stroke of the palsy, “he should take a peep into the next century.” The immediate cause of the disorder which carried him off, was a sudden surprize, on receiving, whilst at Canterbury, a letter informing him that Mrs. Ducarel was at the point of death. He hastened home, took to his bed, and died in three days; and was buried in his favourite church of St. Katharine, on the north side of the altar, in a vault which (as has been already mentioned) he had many years ago selected for that purpose. Biog. Brit, by Mr. Nichols reprinted with additions and corrections in his Anecdotes of Bowyer.